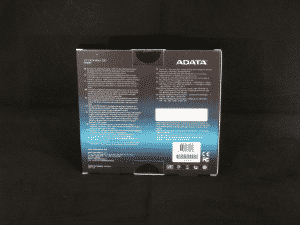 Everyone knows ADATA for their storage and memory product lines. A bit lesser known in these parts are their SSD’s. Today we have a chance to review their new line of SSD’s the XPG SX900. Its based off the venerable Sandforce 2281 controller like the Vertex 3 so it should be a good performer. Let’s see how it stacks up against other drives. Below are the basic specifications, sourced from the ADATA website, and they apply to all of their SX900 based drives. 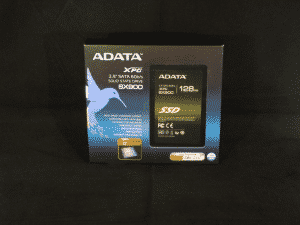 While not listed below, this card is based off the Sandforce 2281 controller as mentioned in the introduction, just like the OCZ Vertex 3 which first brought it out. The Vertex 3 was a pack leading performer, but had trouble initially with its firmware (resolved), and I would expect this drive to perform right around that drive. 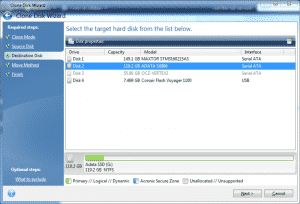 In every drive, due to the GB to GiB conversion, there is always some leftover space that is unavailable to the user. With normal drives, this space is used by the drive for RAISE (Redundant Array of Independent Silicon Elements or for over provisioning (typical for ‘normal’ SF based drives). RAISE is essentially an error correcting layer. 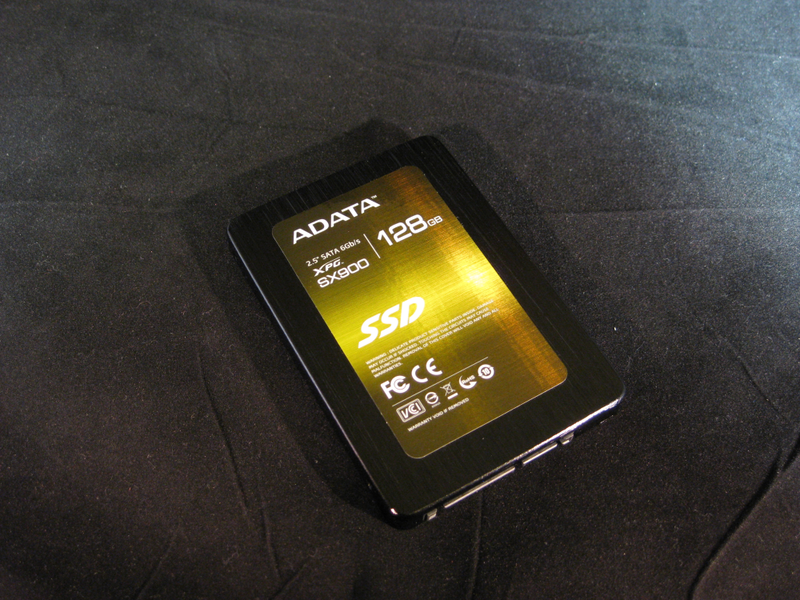 However, the ADATA drive simply disables the use of RAISE to gain the extra 8GiB. Sandforce believes that the intrinsic “…55bit BCH ECC should be effective enough for error handling”. 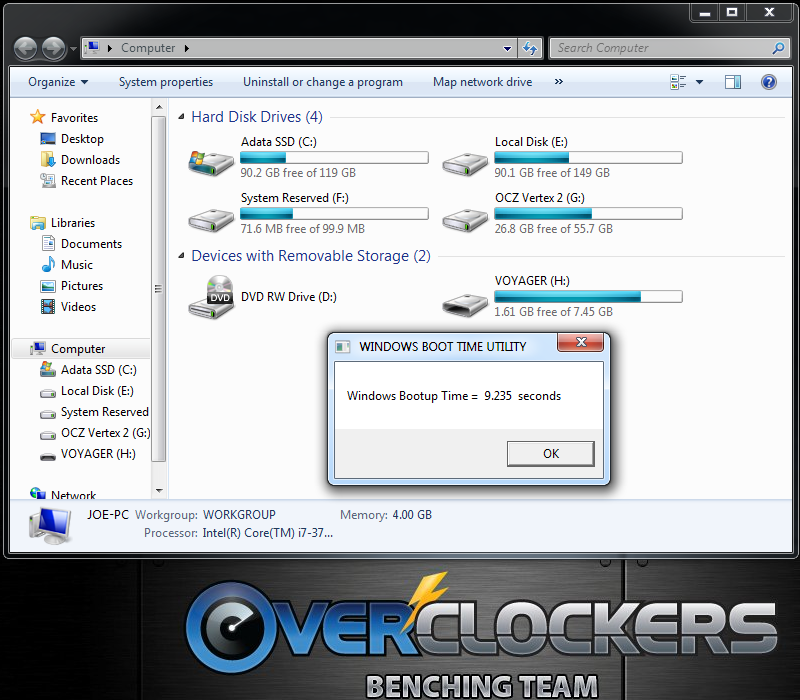 While 8GB shouldn’t be a make or break amount on a drive, more available space in an SSD is always welcomed. 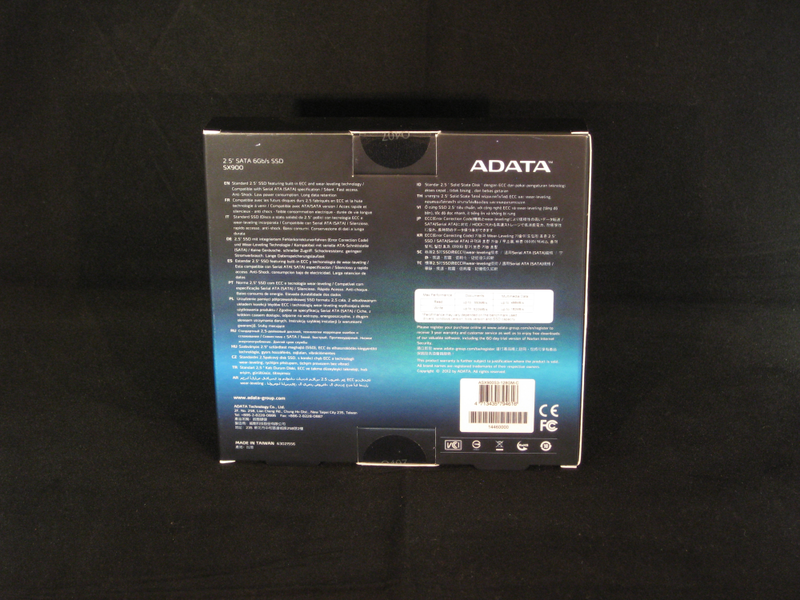 Below you will see the retail packaging for the ADATA drive. On the front you see what looks like a hummingbird in a black to blue to black again color scheme. On the left side are some basic features of the drive such as its capacity, and the included backup/recovery software which we will talk about later. The backside goes over more details. Inside the box the drive itself sits securely in a plastic tray with the included accessories below it. The accessories included are a 2.5″ to 3/5″ drive adapter, screws to mount the drive to the adapter and case, as well as Acronis and SSD instructions. Exactly what one needs to get this unit up and running without fuss. 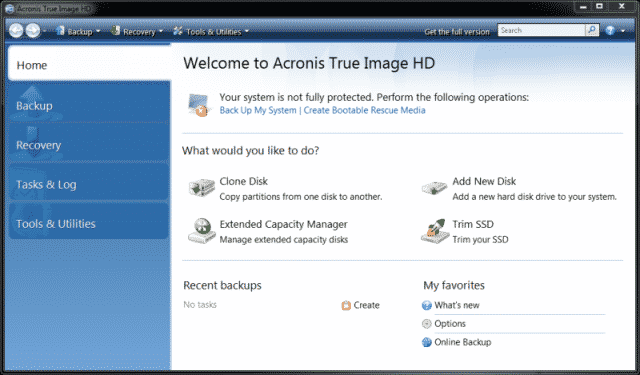 ADATA was kind enough to give buyers of this product (and many others) a free copy of Acronis True Image HD software to help you transition to this drive. I have used multiple versions of this software in the past for imaging drives and have a particular fondness for it. 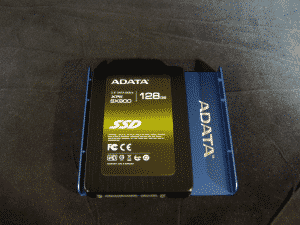 I quickly imaged the drive with the software and dropped (restored) the image onto the ADATA drive with no issues. I really like the addition of cloning software so you do not have to reinstall your OS and applications when getting the drive. Below are some screenshots of Acronis and the basic steps to complete an image and restore. In this case, I had created an image of the current OS, restored it to the ADATA SSD and got back into Windows on the ADATA drive in less than 10 minutes. Mind you this was from SSD to another SSD, but just wanted to show how quick and painless the process can be in an ideal scenario. 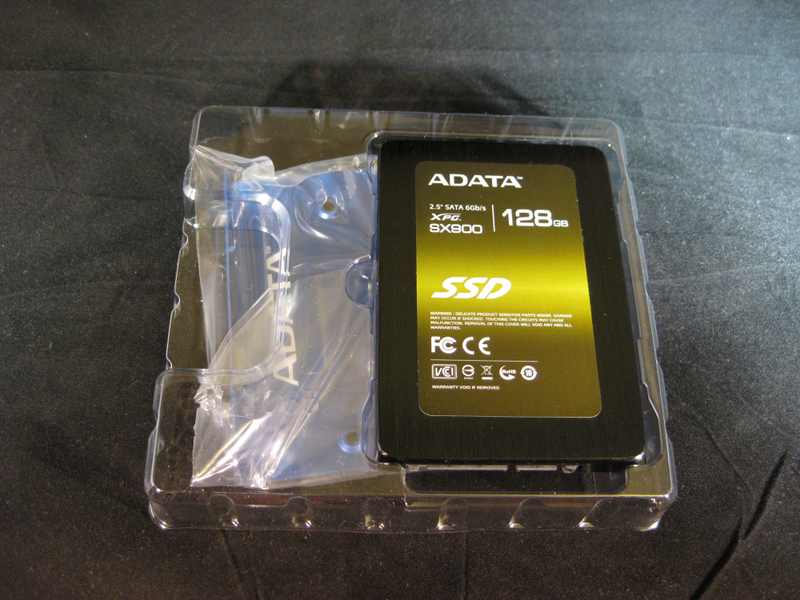 Taking a look at the drive itself, it has gold/yellow sticker on the front describing what is inside. On the back side is the serial number(s), SATA port and power, as well as the warranty sticker warning you not to remove it unless you prefer to be without the warranty on the drive. 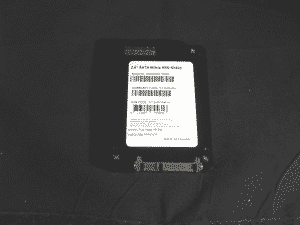 Last is the drive mounted in its 2.5″ to 3.5″ adapter. 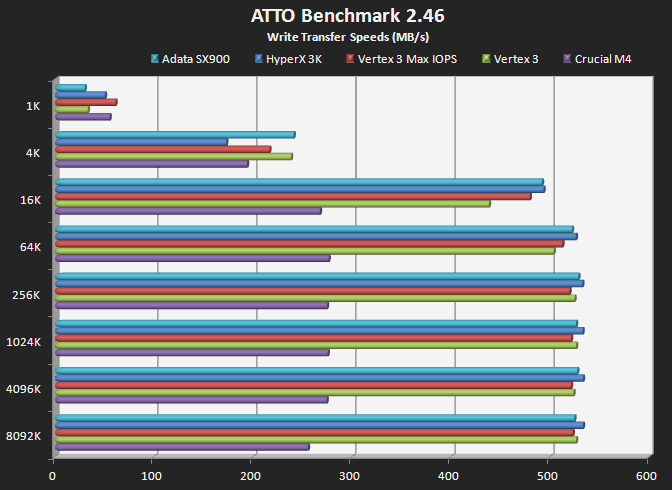 We will start our benchmarks with ATTO. This benchmark is what most manufacturers use to test their specified speeds. Taking a look at the read results first, you can see that this drive keeps up with the pack or surpasses them in all the tests listed, including the Vertex 3 Max IOPS. So read speeds are as advertised or even higher. The second graph shows the write speeds. Looking at these results you see the same story, meeting or exceeding listed specifications. 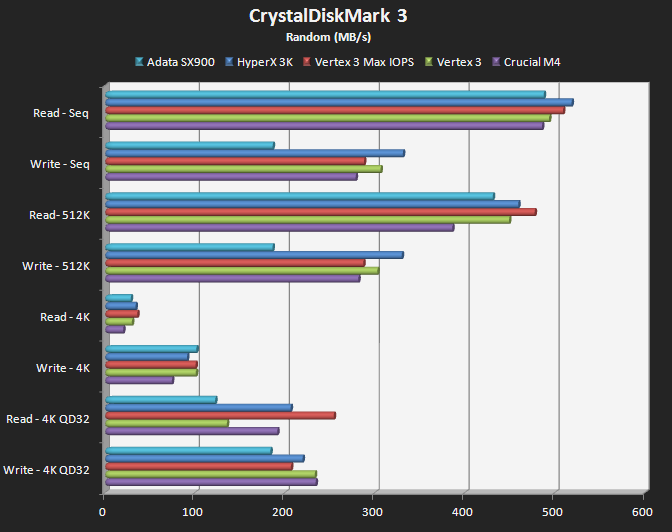 4k writes are also the second fastest out of this group of drives losing only to the Vertex 3 IOPS and handily beating HyperX 3K and Crucial M4. 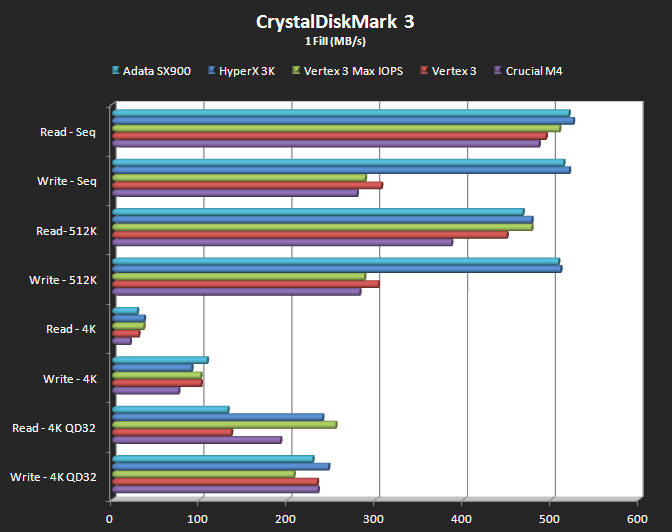 CrystalDiskMark3 shows some interesting results compared to ATTO, in the first graph (default) especially in the 512K and Sequential writes where this drive is significantly slower. 4k Reads/Writes however, where this drive is optimized (at least in the writes) puts up a great showing leading the field in writes and in the middle of the pack in reads. The drive doesn’t seem to respond well to a higher Queue depth in the random fill testing with is odd to me with the Sandforce 2281 controller. Looking at the 4kQD32 results this drive comes in last here. Checking out the 0 fill (writes/reads the drive with “0’s” ) begins to tell a different story. Outside of 4kQD32 read results this drive is towards the front of the pack, and significantly in the 4kQD32 writes by a huge margin. Moving on to the 1 fill result (writes/reads the drive with “1’s”), tells just about the same story…a tough finish in 4kQD32 reads, but solid front running results in most cases. 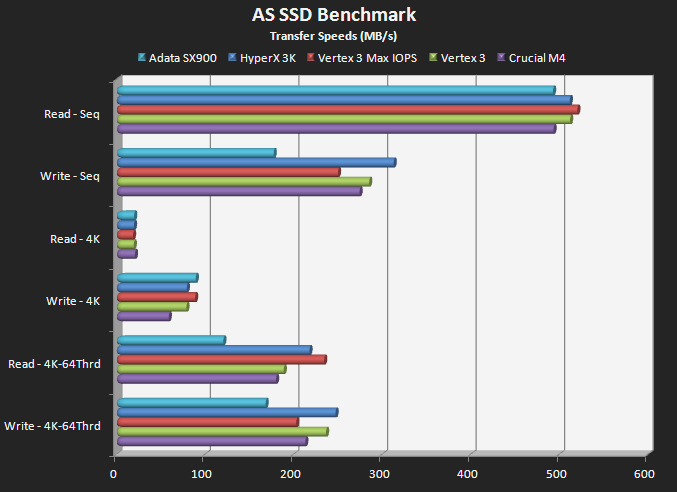 Checking out AS SSD results, per ADATA’s specifications above, the results fall right in line with the 486/182 results expected in Sequential reads and writes. 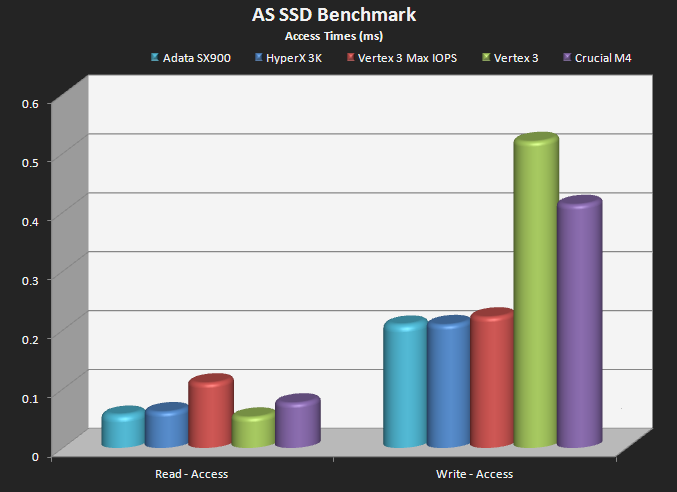 When comparing the write results with the other drives, its last in this benchmark. 4k random writes in this bench put it on top with reads being right with the group. 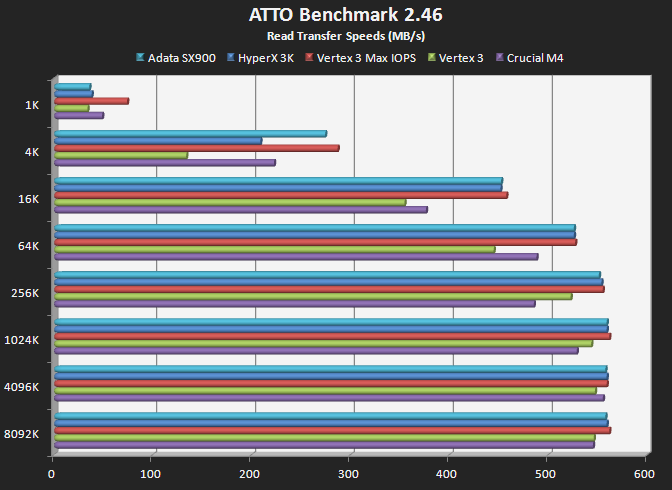 The last test in this graph, the 4k 64thrd both read and write the ADATA drive comes in significantly behind the other SSD’s. In the Access Time graph this drive leads the pack in both reads and writes by a fairly small margin. 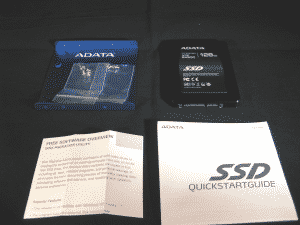 ADATA kindly recognizes the differences between ATTO and AS SSD and has published in its specifications their expectations from this benchmark of 486 Read and 186 write speeds. Looking at the sequential reads and writes in the graph below, you can see they were spot on. 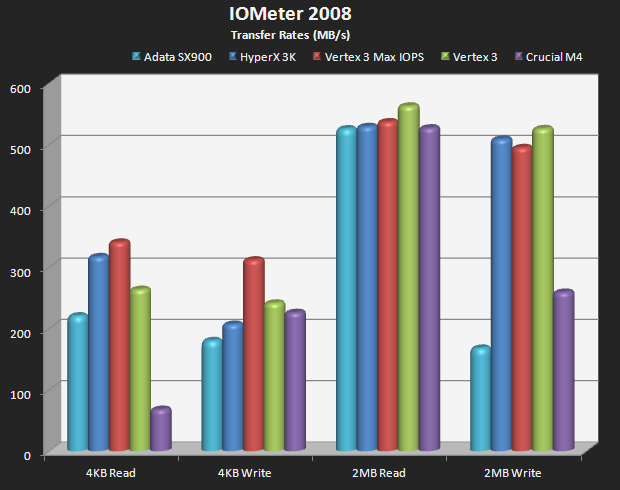 The last synthetic test we have for the ADATA XPG SX900 128GB drive is IOMeter. After a bit of fighting with the drive, the IOMeter settings and, a fresh OS install, I was finally able to achieve close to expected results. Initially I was seeing VERY low results where this drive should excel (4k writes). Transfer rates do fall a bit lower than most in this group than the other drives, but still shows right in the mix. 2MB reads match up with the group tested, but for some odd reason, the 2MB writes are trailing the pack by a fair margin. 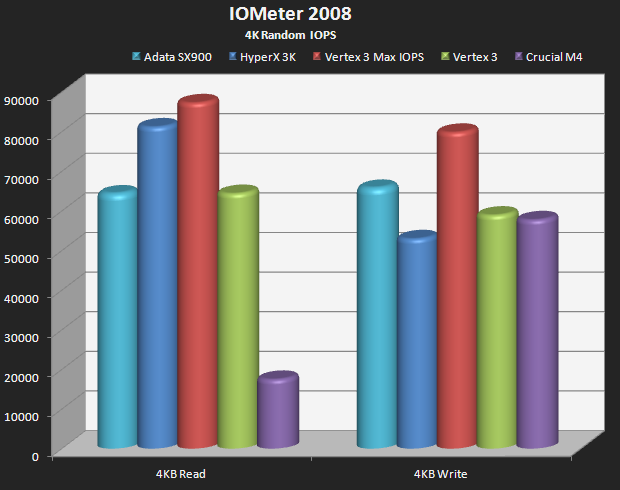 IOPS for 4k Random Reads end up in the middle of the pack, with 4k writes trailing only the Vertex3 IOPS. 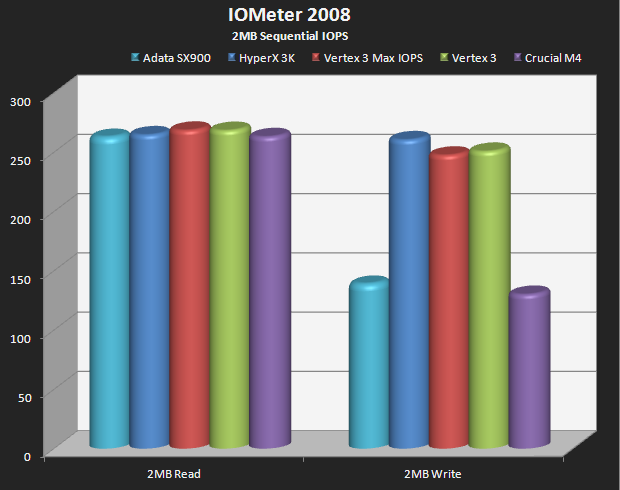 When looking at the 2MB sequential IOPS we see a strong performance in reads, but trailing the pack in writes again. Moving on to Boot Timer, I imaged a 30GB installation of my test bench OS which holds all of the benchmarks, including games (on another drive) on the drive. So its a full blown, but fairly clean installation. You can see below this unit booted to a functional windows environment in 9.2 seconds. Less than 10 SECONDS! Amazing what SSD’s can do to boot times! 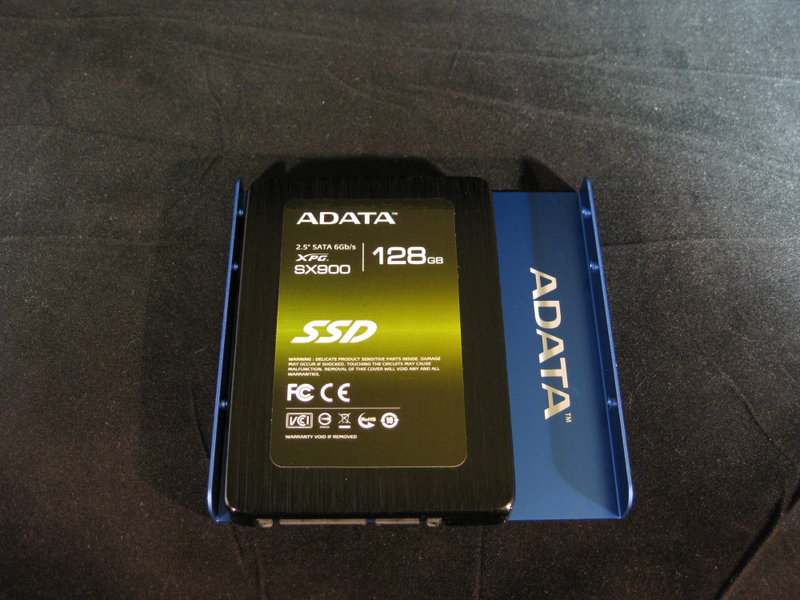 ADATA has brought to the table one of many SF 2281 controller based drives. One of the features that set this drive apart from others is the slightly more available space (about 8GB on this 128GB drive) bringing the available space to 119GB by disabling the RAISE functionality most drives use. 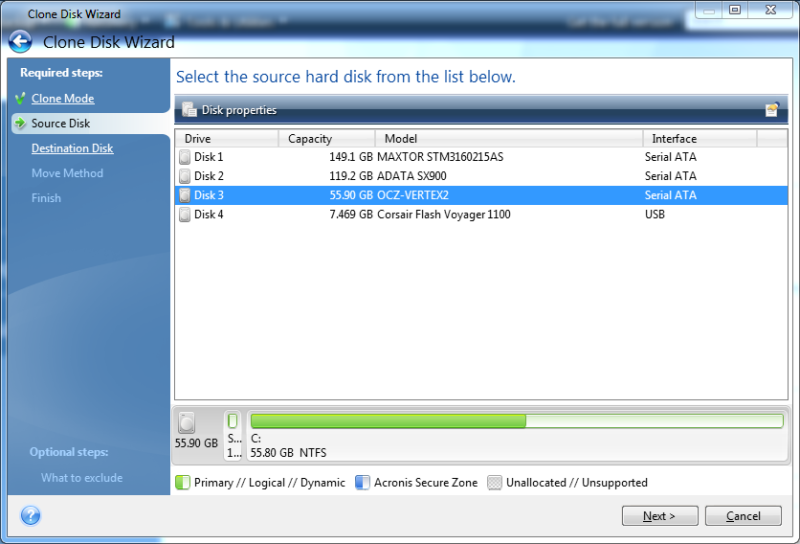 Drives with this enabled usually show around 111GB available with the same amount of over-provisioning. While the 8GB of additional space shouldn’t be a make or break for anyone, its always nice to have more space on an SSD. Performance was as expected on most tests other than IOMeter. 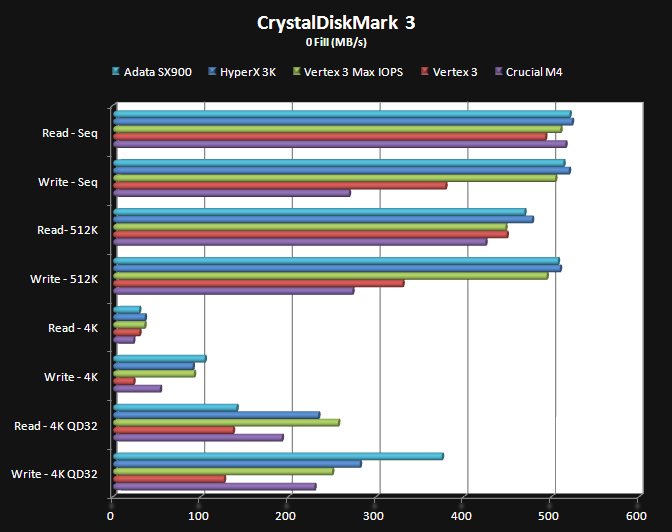 The ADATA drive up kept with or beat the Vertex 3, Crucial M4 and Vertex 3 Max IOPS in most tests so the performance is there. What about the pricing? Currently the drive at Newegg is $139.99 with free shipping. This is actually the most expensive, by $15 over the Crucial M4 (128GB), and by $25 over the Vertex 3 (120GB). With the performance where its at, I would have liked to have seen the price about $10-15 lower to make it an easier choice, but on the other hand, you do get an extra 8GB of space along with comparable performance in most cases. Overall, I am quite pleased with the performance of this drive. It keeps right up with its competitors, beats them in some testing, and it has some extra space available. 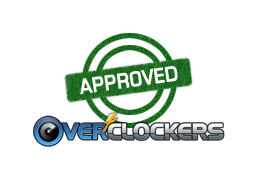 However it is the most expensive drive in the group at Newegg. Still, this drive should be a consideration when looking at the Vertex 3 or Crucial M4 regardless of the slight price premium. As mentioned above, you do have 8GB more space than the Crucial M4 and almost 20 more GB than the Vertex 3 due to their use of the RAISE functionality and starting out with 120GB. I have to admit I was waffling on giving this a “Meh” stamp due to the price, but have decided to give this an approved stamp as I believe a lot of people can justify the small price differences for several more GB of space.